Eastern Sky Landscaping does fine professional work. They built a retaining wall and a patio for us. Excellent design, fine material, and workmanship. Great people! 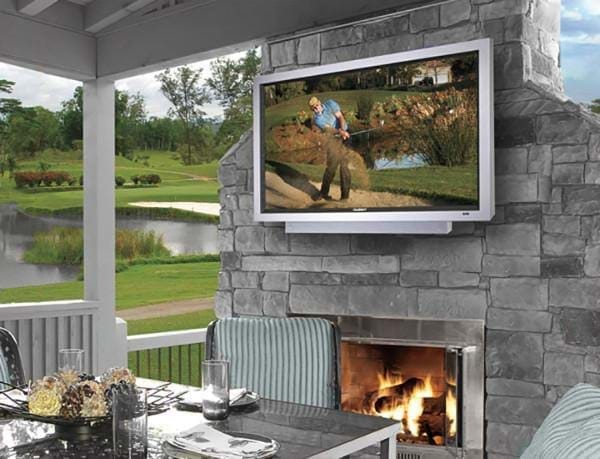 Eastern Sky Landscaping wants you to enjoy your outdoor areas. Our goal is to design welcoming and harmonious spaces that support fun activities and memorable moments with your family and friends. Landscapes include more than just plants. 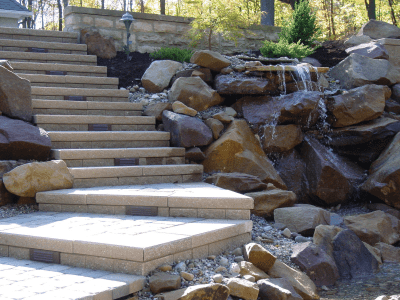 Hardscaping refers to the design and installation of non-living, permanent features and structures, such as walkways, patios, fireplaces, water features, steps, seating walls and retaining walls. 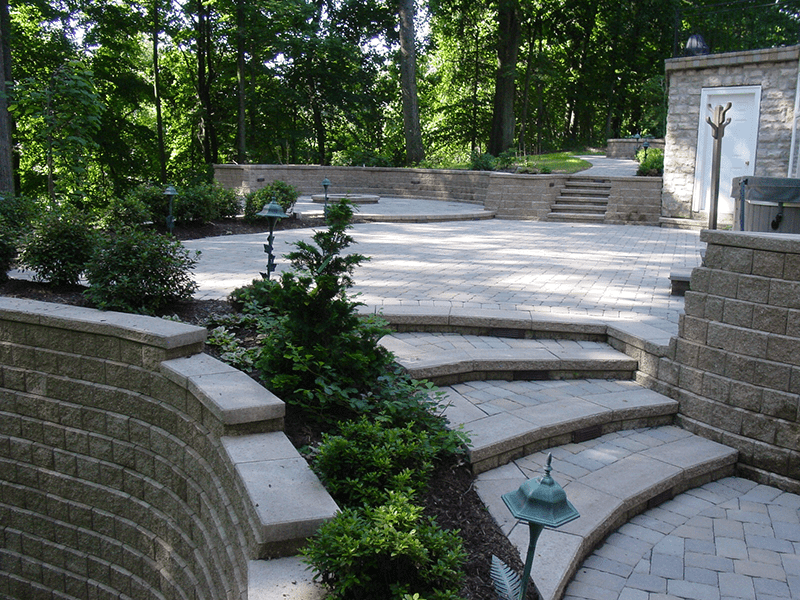 Eastern Sky Landscaping can incorporate hardscaping and lighting into your existing landscape design or create an entirely new design. 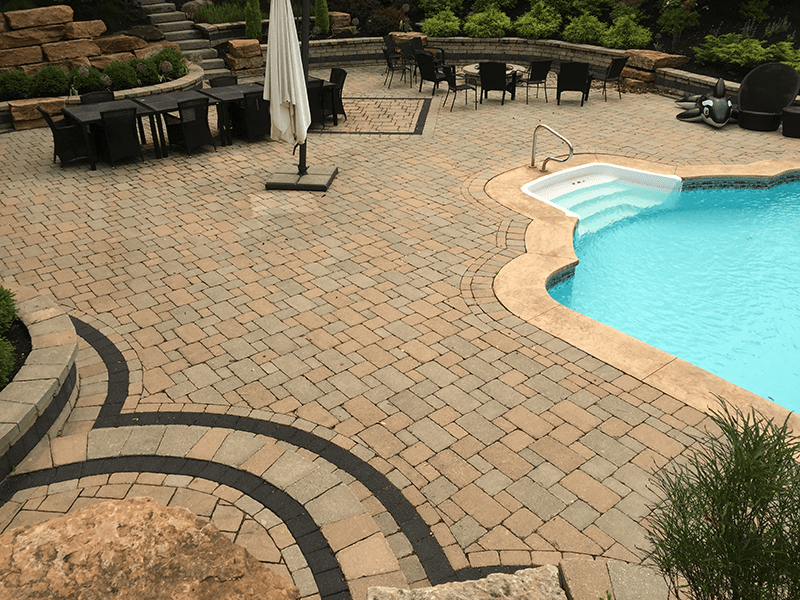 Our hardscapes add continuity and flow between your home and garden, function and usefulness to your outdoor living spaces, and long-lasting beauty to your property. Quality hardscaping can improve drainage, prevent erosion and help maximize the use of your property, while outdoor lighting allows you to enjoy your outdoor living spaces in the evenings and can improve safety and curb appeal. Decorative elements such as pergolas, seating walls, benches, and water features will add style and serenity to any landscape. 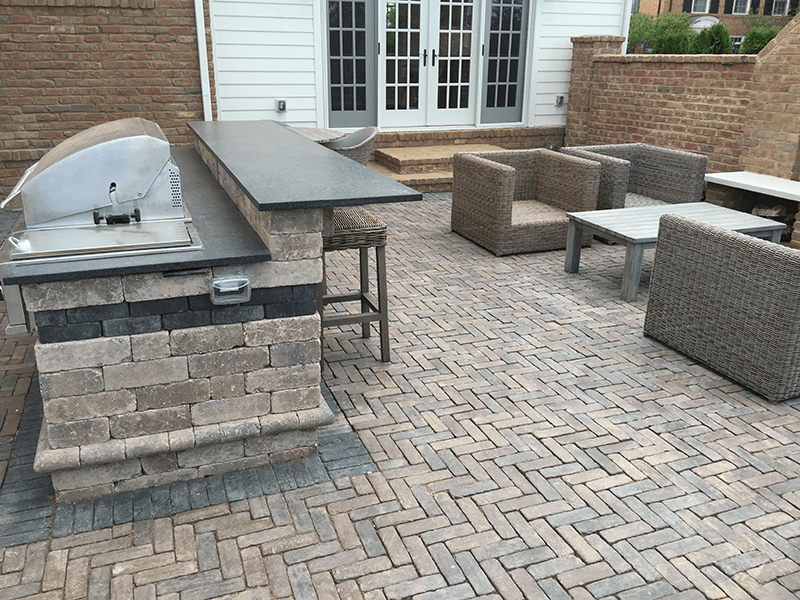 Eastern Sky Landscaping works with traditional materials, such as flagstone, slate, granite, sandstone, limestone, and crushed gravel, as well as modern interlocking pavers and segmental wall blocks. Each of these materials offers a different style and aesthetic to fit your own personal preference and budget limits. Why Choose Eastern Sky Landscaping? 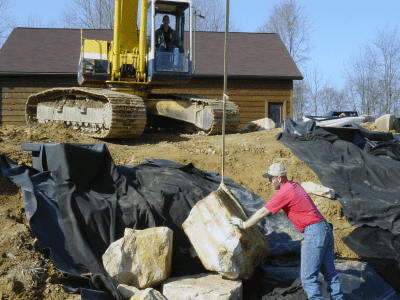 Eastern Sky Landscaping has been providing expertise in landscape design and construction services to residential and commercial clients in Central Ohio since 1999. Eastern Sky Landscaping assists you in your decision-making process, makes suggestions and provides you with a comprehensive assessment. At all times you will have the opportunity to be in contact with the owners - no middle-man communication. 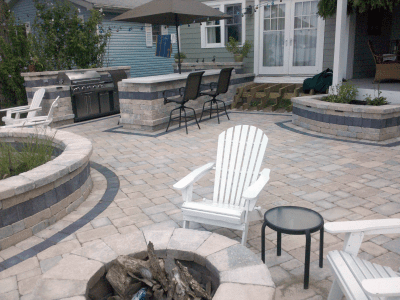 Eastern Sky Landscaping provides unique and sustainable landscape and hardscape design solutions that meet your budget. In addition to our 2-year warranty, you will also receive a 2-year warranty from Unilock, backing up the work completed by their authorized contractor. 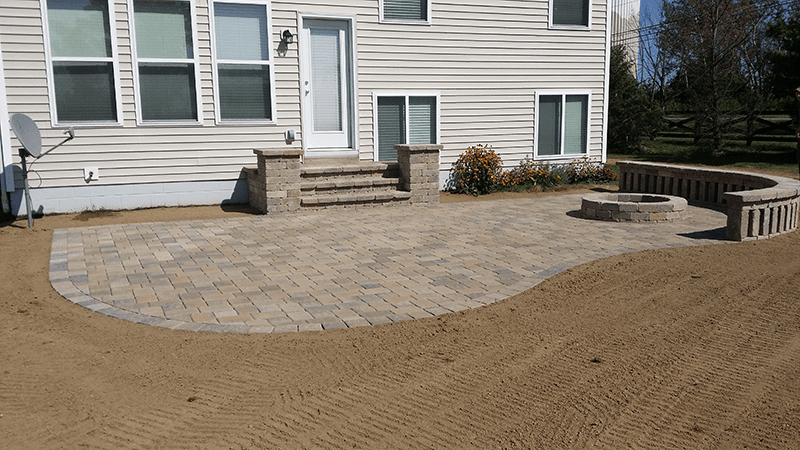 As a family-owned and -operated business, Eastern Sky Landscaping provides attention to detail and a level of care as if your home were our own. We are certified in the following areas: ICPI, NCMA, and Unilock. Chad Ford, owner, operator, and designer, graduated from the Art Institute of Pittsburgh after receiving a prestigious scholarship. You will benefit from his ability to create a one-of-a-kind outdoor living space, designed with an artist's eye. Exceptional customer service is a top priority. Eastern Sky Landscaping completes one project at a time. You don't have to worry about us starting your job then leaving to complete another. Our BBB A+ rating speaks for itself. The outcome of our projects reflect our quality workmanship and pride that we put into each and every job. When quality and high standards count, Eastern Sky Landscaping can be counted on to get the job done. We are confident we can exceed your expectations. Eastern Sky Landscaping is your one-stop location for all of your outdoor needs, for both residential and commercial properties. Enjoy our expanding library of customer questions answered from the vantage point of Chad's 20+ years of experience in the landscaping industry. There’s snow and ice all over my deck. What should I do? I live in Ohio where it's cold six months out of the year. How much use could I get out of a fire pit?